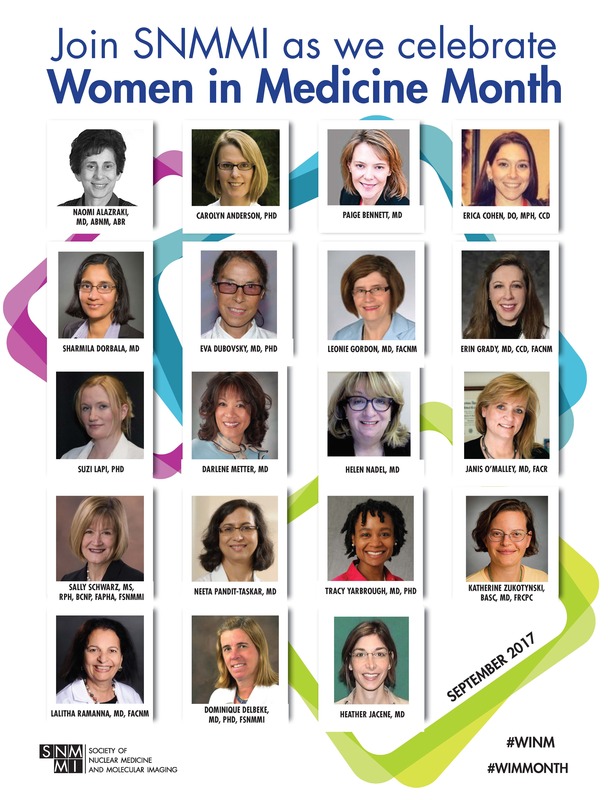 Join SNMMI throughout September as we celebrate Women in Medicine Month (#WIMmonth), and Women in Nuclear Medicine (#WINM). 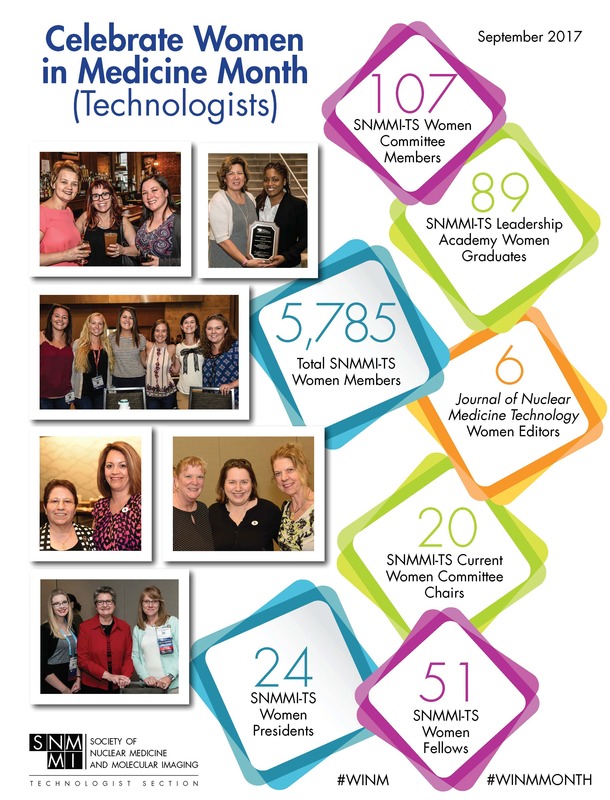 We thank them for their tireless efforts to support the advancement of women in medicine and nuclear medicine! Dr. Alazraki has served as President of the Society of Nuclear Medicine, 1990-91 and as Secretary, Trustee (8 years), representative to the Academy for Radiology Research, Chair of the Academic Council, and has served on the Board of Directors of the Education and Research Foundation for Nuclear Medicine and Molecular Imaging. She also served government in the following capacities: NIH, Diagnostic Radiology Study Section Advisory Committee; FDA, Chair, Radiological Devices Panel of the Medical Devices Advisory Committee; NRC, Advisory Committee for Medical Uses of Isotopes; VA, President, National Association of VA Chiefs of Nuclear Medicine and Chief Medical Director’s clinical and programs advisory council. Dr. Alazraki was the first woman historian for the SNMMI. Carolyn J. Anderson, Ph.D. is a Professor of Radiology, Pharmacology & Chemical Biology and Bioengineering. She is the Director of the Molecular Imaging Laboratory at the University of Pittsburgh and Co-Director of the In Vivo Imaging Facility at UPCI. Dr. Anderson spent over 25 years developing PET tracers at Washington University before leading pre-clinical oncological imaging in Radiology at Pitt and UPCI. Dr. Anderson pioneered the development of radiometal-labeled receptor-targeted PET imaging agents, leading the first human study of 64Cu-labeled octreotide in patients with neuroendocrine tumors. Associate Professor Radiologic Sciences-Radiology at Wake Forest Baptist Medical Center. Dr. Cohen is the Assistant Chief of Nuclear Medicine at Edward Hines VA Hospital and is an Assistant Professor of Radiology at Loyola University Medical Center. She sits on the Board of Directors for the American College of Nuclear Medicine and Secretary on the SNMMI Academic Council. She has served as Vice Chair of the SNMMI Young Professionals Committee, is a Delegate to the American Medical Association, and national faculty for the National Board of Osteopathic Medical Examiners. Dr. Cohen is a past recipient of the Robert Henkin Government Relations Fellowship and SNMMI-ACNM Sino-American exchange program. Professor of Radiology and Radiological Sciences, is a nuclear medicine physician and is currently the Section Chief for Nuclear Medicine. She has co-edited five textbooks, given lectures at more than 100 national and 35 international meetings. She is a past President of the Society of Nuclear Medicine and past editor-in Chief of the Journal of Nuclear Medicine. Most recently she was awarded the Presidential Distinguished Educator award by the Society of Nuclear Medicine and Molecular Imaging. She is a nationally distinguished figure whose special areas of interest include radionuclide evaluation of renal transplant recipients and patients with renovascular hypertension. She is regarded as an excellent teacher by the residents and her review sessions are considered indispensable by seniors preparing for the oral boards, and has served as an oral board examiner for the American Board of Radiology. Leonie Gordon MB ChB, is a tenured professor of radiology at the Medical University of South Carolina in Charleston. She is the director of nuclear medicine as well as the Vice Chair of Education She is the senior Associate Dean for Faculty Affairs and development. She is the author of more than 75 publications and is a frequent invited speaker. Currently she is the Associate Executive Director of the American Board of Nuclear Medicine and Chair of the Women in Nuclear Medicine Committee. Assistant Professor, Radiology, Dana-Farber Cancer Institute. She currently serves as Chair, SNMMI Young Professionals Committee. Suzanne Lapi, PhD is the cyclotron facility director and an associate professor in the Department of Radiology at the University of Alabama at Birmingham. Her group's interests lie in the development of positron emitting radiotracers in the life sciences. Dr. Lapi currently serves on the SNMMI Board of Directors and has served as President, SNMMI Radiopharmaceutical Sciences Council. Darlene Metter, MD, FACR is a Professor of Diagnostic Radiology and Family and Community Medicine in the Department of Radiology at UT Health San Antonio. She is board certified by the American Board of Radiology (ABR) in Diagnostic Radiology as well as by the American Board of Nuclear Medicine. Dr Metter is actively involved in organized medicine to include the ABR, American College of Radiology, the Joint Review Committee on Educational Programs in Nuclear Medicine Technology, Nuclear Regulatory Commission’s Advisory Committee on the Medical Uses of Isotopes and the Society of Nuclear Medicine and Molecular Imaging. Dr. Helen Nadel is a Pediatric Radiologist and Nuclear Medicine physician currently on staff in the Department of Radiology at British Columbia’s Children’s Hospital in Vancouver, British Columbia, Canada where she is Head of the Division of Nuclear Medicine. She is an Associate Professor of Radiology at University of British Columbia. Helen has many publications in the field of Pediatric Nuclear Medicine and lectures extensively in her field. She has an international reputation in her field and is sought as a consultant and visiting professor having taught on 6 continents during her career. She is past president of the Pediatric Council of the SNMMI. She is a member of the Board of the General Clinical Nuclear Medicine Council and Secretary/Treasurer of PET Center of Excellence and has been president twice in her career of the Pacific Northwest Chapter SNMMI . She is a past member of the House of Delegates and has served from 2013-2016 as a Director at Large to the SNMMI Board of Directors. Dr. O'Malley is the past chair of the American Board of Nuclear Medicine and was an Oral Board Examiner in Nuclear Medicine for the American Board of Radiology in the past. She has been an active member of the Society of Nuclear Medicine and Molecular Imaging, she has served as Chair on the SNMMI Education Committee Chair, Associate Chair for Continuing Education on the Scientific Program Committee, and member of the ACNM/SNMMI Joint Governance Committee, Future Leaders Academy Taskforce and Academic Council. Dr. Ramanna is Board Certified in Nuclear Medicine with fellowship training in Nuclear Medicine and Positron Emission Tomography (PET). She has practiced at Providence Little Company of Mary for over 10 years. Dr. Ramanna has been very active both in local and national Nuclear Medicine organizations, and has organized and lectured at several conferences. More recently she served on the American Board of Nuclear Medicine (ABNM), responsible for certification. Dr. Ramanna was the first woman President of the ACNM. Sally is the Professor of Radiology, Director, PET Radiopharmaceutical Production and Co-Director Cyclotron Facility in Radiology and the Washington University School of Medicine. Sally is the SNMMI Immediate Past President and has served on the Radioactive Drug Research Committee as Executive Secretary , Advisory Committee on the Medical Uses of Isotopes (ACMUI), U.S. Nuclear Regulatory Commission, Committee on Pharmacopeia, Society of Nuclear Medicine and was co-commissioner on The Lancet Oncology’s Moonshot Commission, representing SNMMI and Washington University. Dr. Pandit-Taskar is a nuclear medicine physician with extensive experience in clinical nuclear medicine, and is involved in day to day clinical use of radipharmaceuticals for diagnosis and therapy; conducting and interpretation of SPECT CT, PETCT and nuclear cardiology studies. She is focused on radiopharmceutical therapy and studying the use radiolabeled monoclonal antibodies to detect and treat cancers. Tracy Yarbrough is co-owner of Global Advanced Imaging, PLLC. In addition, she is an Associate Professor of Pharmacology and Physiology at George Washington University in Washington, DC. She has been extensively involved with education, having been a prior program director for a nuclear medicine residency, ACGME nuclear medicine residency review committee member, and a scientific abstract reviewer for ACNM, SWCSNMMI, and SNMMI. She has been a member of the ACNM Educational Committee and SNMMI Academic Council. Katherine Zukotynski is an Associate Professor in the Departments of Medicine and Radiology at McMaster University. She is board certified in both nuclear medicine and radiology in both the United States and Canada. Dr. Zukotynski is currently serves as the Treasurer & Secretary of the SNMMI, the first women President of the PET Center of Excellence, President of the EGL SNMMI chapter and a board member of the SNMMI Correlative Imaging Council. She completed the SNMMI Future Leaders Academy in January 2015 and obtained the Leadership Essentials Certificate from the University of Toronto in October 2015. In 1898, Madame Marie Curie discovered two radioactive elements, polonium and radium. In 1903, Marie Curie along with Henri Becquerel and Pierre, won The Nobel Prize in Physics "in recognition of the extraordinary services they have rendered by their joint researches on the radiation phenomena discovered by Professor Henri Becquerel". In 1935, Irene Joliot-Curie along with her husband, were awarded the Nobel Prize for Chemistry for the synthesis of new radioactive isotopes. Brenda King, CNMT, FSNMMI-TS, 1st African American woman President of the SNMMI-TS.